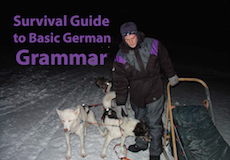 Are you overwhelmed by German grammar? Are you afraid of speaking German because you might make a grammar mistake? Red grammar: Things you MUST know. Otherwise nobody will understand you and/or you will sound like an idiot. Yellow grammar: Nice to have. You will sound more natural. Learn it if you have time. No big problem if you get it wrong though. Green grammar: If you want to be really good or pass an exam, learn that too. However, if you make mistakes with this in spoken German, native speakers will barely notice.